For the past few years, many city dwellers have been vigorously flying the flag for “Predator-free New Zealand” while, ironically, a scourge of pests have been running wild at their feet. Yes, in urban New Zealand, our pests are having a field day. North Shore branch members take part in council-run training session. Throughout New Zealand there is no nationwide council-led effort to build on the good work of DoC and eliminate pests in the city. Indeed, the vast majority of our urban parks and reserves are in fact faux sanctuaries. As birds spill out from our pest-free Hauraki islands into the parks and reserves of our biggest city, Auckland, they quickly find these green spots are booby trapped with stoats, possums and large numbers of rats which keep birds at bay by munching on their young and competing for their food. So for the past two years we have worked with our biodiversity officer at Auckland Council, Paul Duffy, to create a template, so community groups can control the pests in our city’s parks and reserves. The recipe for operation urban birdlife: one energised Forest & Bird branch, a determined biodiversity officer, some baiting stations and a lot of perseverance! There are a number of issues with volunteers using poison bait in a residential setting, including safety of users, risk of secondary poisoning to wildlife and pets including dogs, risk to children, and opposition from various residents, so I can’t say it’s been an easy path but we’ve got there. By working with Auckland Council and Te Ngahere Native Forest Management, we have developed clear guidelines for everything from health and safety training processes to the creation and placement of warning signs. 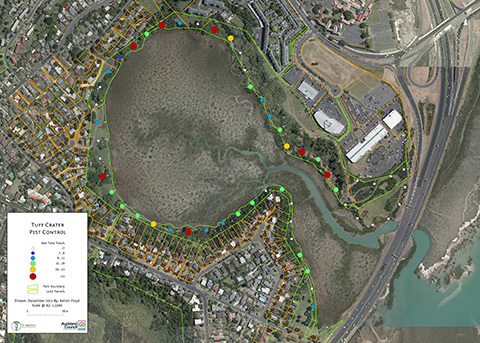 To create two flagship projects on Tuff Crater and Centennial Park, the council provided our volunteer team with a baiting grid plan, bait stations, a ½ day training session and some start-up bait last year. 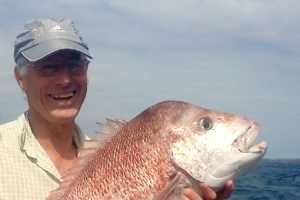 It’s just up to us to secure funding for more bait, which thankfully, comes at a small cost. 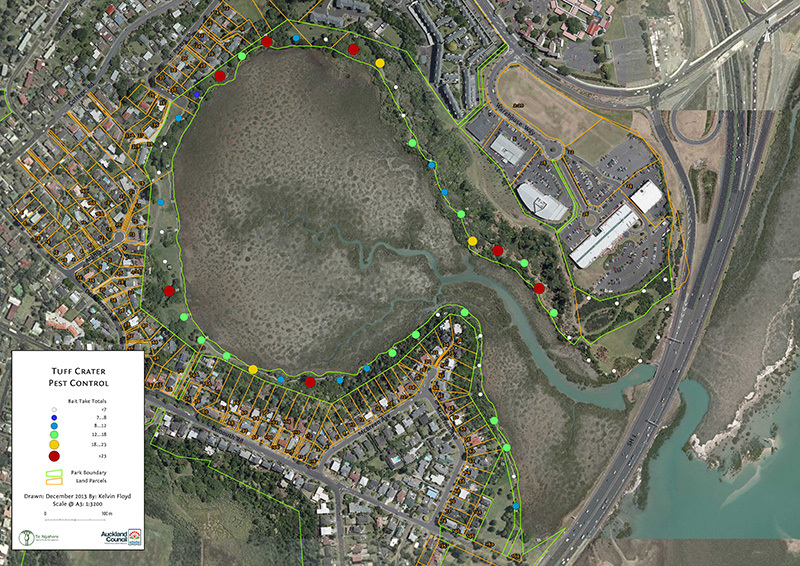 These two restoration projects are a key part of the North-West Wildlink which aims to join the green dots from our pest-free Hauraki islands to the Waitakere ranges, so hopefully now pest control is in place, we’ll see some insect bounce-back and perhaps a little avian sanctuary spill-over. We’re keeping our eyes peeled for bellbirds – a pioneering bird that is known to stray from sanctuaries to establish themselves in urban areas. After that initial training session, we’ve been flying solo and, so far, there have been no hiccups. So that the Auckland council can update the grid plan, we feed them data of bird numbers, bait take and pest numbers through tracking tunnels which they pass into the Auckland University statistic database. Using this, they can create easy-to-understand maps (see above), so we can easily see how the project is tracking. Paul Duffy is hoping to roll out this template across the country – and he already has close to ten community groups in the wider Northern region helping to eliminate pests in their backyard reserves through trapping and baiting. Already two Forest & Bird branches – Mid-North and Hibiscus Coast – are using the template with great success. 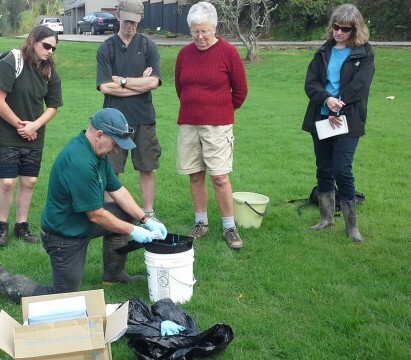 One of the strategic goals of Forest & Bird is to “promote conservation in urban areas where most New Zealanders live and work” and now with this template at hand, any community group can tackle the pests in their backyard reserve or park.